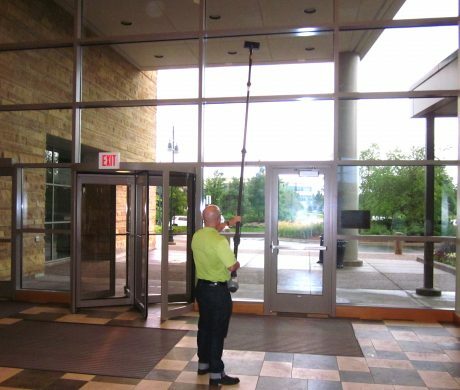 The Cleano is the perfect tool to sanitize surfaces above the floor. This all-in-one tool is equipped with interchangeable microfiber pad holders and refillable, easy to change solution tanks. The Cleano can spray and clean in any position; just add your approved cleaner or sanitizer and it is ready to work. The Cleano was designed to be as easy and ergonomic as possible. It is lightweight, weighing only two pounds, and has a no- twist mechanism that keeps the tool aligned and avoids the need to twist the wrist. 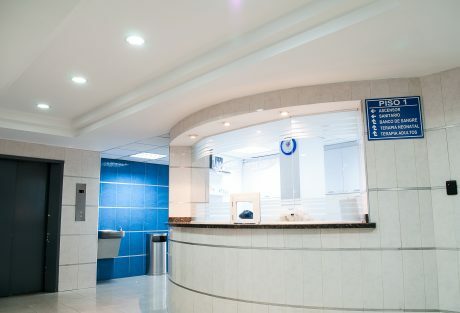 These features help make larger jobs easy to clean, such as cleaning cafeterias. The Cleano features a mechanical pump unit that is operated by hand. No electricity is required, which helps to save money and proides an added convenience. It has micro-spray technology as well that guarantees optimal distribution of the right amount of solution on the surface. The Cleano features a mechanical pump unit that is operated by hand. No electricity is required, which helps to save money and provides an added convenience. It has micro-spray technology as well that guarantees optimal distribution of the right amount of solution on the surface. 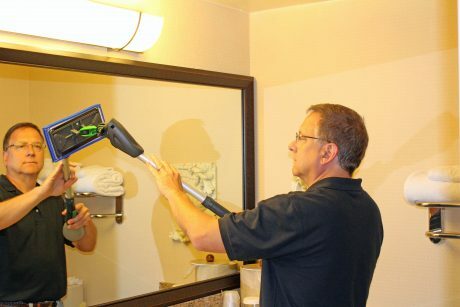 The Cleano has the option to be used chemical-free with microfiber pads and pure water that can assist in an improved way of cleaning glass surfaces such as mirrors and windows. With no chemical to leave behind residue, windows stay clean longer and there can be significant savings in eliminating chemical costs.